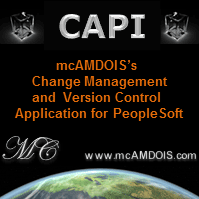 Something about PeopleSoft you want to start a discussion about? 28 Apr 2018 13:59 Jump! 20 Nov 2017 06:22 Jump! Peoplesoft Built-In File Attachment Error: File transfer failed due to unspecified error. 13 Jan 2016 19:45 Jump! Pension batch process - very slow! Pension batch process - very slow! How can I improve the performance? 19 Nov 2015 19:41 Jump! Does anyone have either PeopleSoft Time and Labor FAQ or Interview Questions? 11 Jul 2015 00:07 Jump! 20 Apr 2015 10:25 Jump! Ecorp Trainings, One of the best institute providing quality level of training in E-learning & Corporate Services. We offer instructor led online training. Classroom trainings are conducted in Hyderabad , India. Is it possible to build file maintenance reports or audit reports for specific changes? 22 Aug 2013 14:07 Jump! 20 Aug 2013 12:13 Jump! 06 Aug 2013 14:26 Jump!